Chaniot suffered much from the Durrani inroads during the last half of the eighteenth century and also during the troubles of I848 because it remained the scene of constant fierce struggle among the leaders of local factions. As per the local legend, portion of the wall, surviving in situ, had been built during Hellenic period. The veracity of the wall's association with Alexander the great is yet to be proved though. But the sit does give evidence of its distant past. During the Mughal era, Chaniot produced many intelligent personalities and talented artisans who occupied positions in the Mughal courts, Nawab Saad Ullah Khan and Nawab Wazir Khan held the post of prime minister of India and the Governor of Lahore respectively during the rule of King Shah Jehan. Artisans of Chaniot have instinctive good taste and they have achieved a distinctive excellence in woodwork. Masons of the town are said to have been employed during the construction of Taj Mahal at Agra and Golden Temple at Amritsar. Special type of furniture with brightly lacquered woodcarving is made in Chaniot and is famous all over the world. What this internationally acclaimed craft of the town needs is an institutional patronization and extensive efforts for international marketing? Made in Chaniot furniture is already being shipped to different countries but so far there are very little marketing efforts being made for this purpose. It can be a potent source of earning foreign exchange if attention is paid to and earnest efforts are made. Sadly, the trained incompetents responsible for export promotion do not see this and the unique potentials are not being taped yet. The first exhibition of Chanioti furniture in Islamabad last year was attended by large number of people from all walks of life. Particularly foreigners appreciated the furniture for its style, solidity and the cost. Apart from furniture, there are more attractions for any visitor to this off the beaten track tranquil town. A towering architectural masterpiece Shahi Mosque, which was built during rule of Mughal King Shah Jehan by Nawab Saad Ullah Khan in 1655, is still functional. It resembles the Shahi Mosque Delhi that was also built under the supervision of Nawab Saad Ullah Khan. After the invasions of British, the city lost its old glory and importance. However, the historical buildings and their ruins are scattered in and around the city, reflect its wonderful past. Another such building is the Umar Hayat Palace commonly known as the Gulzar Mahal. Attracting local and foreign tourist, it is known for its beauty and legendary tales attached to it. The palace is said to have been built by Sheikh Umar Hayat, a rich merchant whose family originally migrated to Chaniot from India. Legend has it that in a village fair at Panda Haitian, Umar Hayat fell in love with a performer girl and married. She bore him a son and a daughter. Umar Hayat grew particularly fond of his son whom he named Gulzar - a rose garden or a sign of happiness. 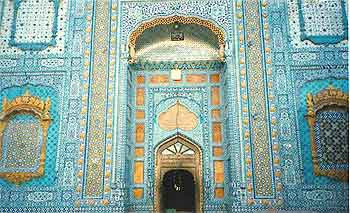 It was for his son that Umar Hayat decided to construct a wonderful palace and name after him. Umar Hayat could not see the palace completed and later his son Gulzar died mysteriously in the palace in the early hours of his marriage night. A different tale reveals that the construction of the palace was a result of rivalry between Umar Hayat and Elahi Baksh - a famous artisan of the time. The latter taunted the Umar Hayat by saying that his artistic abilities were superior to all the wealth in the world. Infuriated, Umar Hayat counter claimed that his money would last long enough to buy all the possible feats skilled artisans could offer. The result of the challenge was the creation of Gulzar Manzil. The construction of the palace started in 1923 and Umar Hayat lavishly spent his wealth. According to one account, the supervision of the construction was assigned to Syed Hassan Shah who gathered famous artisans and carried out day and night work for ten years. 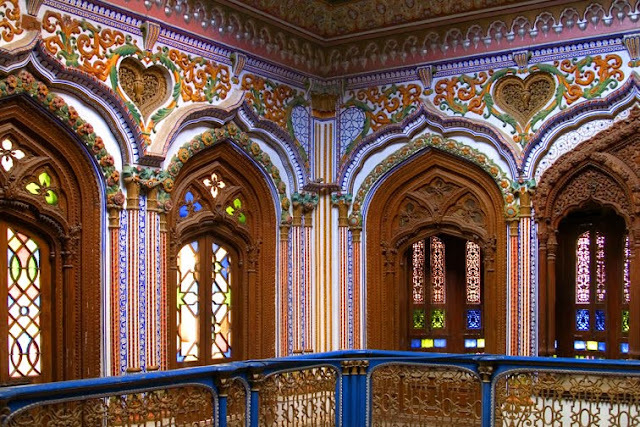 Elahi Baksh and Rahim Baksh did the wood carving, for which the palace is known. Both were masters of the art. The Punjab District Gazetteers reads, "The house built by Sheikh Umar Hayat is a sort of wonder." The imposing building is a work of art. The woodwork, the stucco work, inlay of bricks, use of marbles and floral design in the roof, stairways and balconies are living memories of the glories of the Mughal period. Very elaborate and extensive woodwork in the palace speak of the craftsmanship of the artisans who perfected it beyond amazing limits. One has to possess a sensibility shaped in granite not to be moved after seeing the woodwork even today. The palace originally had six stories including a basement. Two of the upper stories decayed and had to be demolished in 1978. Remains of the building are in the care and custody of Auqaf. Presently it is in public use and houses a library section and a small museum. Market town in the expanses of Punjab bears a prosperous look. Chaniot has every thing necessary for development: hard working and talented people, fertile land, water, communication infrastructure and clean healthy environment. The furniture industry can be converted into important source of earning though efficient 'marketing mix'. Given chance Chaniot can be a nice and rich little city of the future.